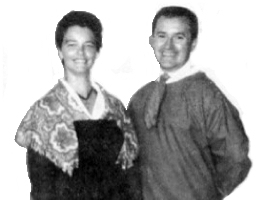 Information: Germain and Louise Hébert, teachers of French dances. Germain Hébert, a native of St. Jean, Québec, has been teaching international folk dance since 1956. He danced with several ethnic groups in Canada and taught at the Canadian Federation's first folk dance camp in 1960. In 1963, a French Industrial Fair visited Québec, bringing dance groups from the Pyranees and Berry who invited Germain to teach international folk dance at their French Folk Dance Camp in Berry. There, in 1964, Germain and his wife Louise learned the Bourée. 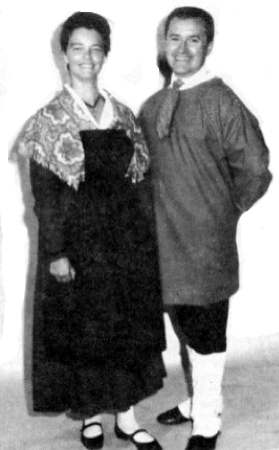 They taught the Bourée in North America in 1966, then returned to France in 1967, 1972, and 1976, teaching in Canada and the United States between trips. Having become a specialist in French dances, Germain has been invited to teach in all the major international folk dance camps in United States. Jabadao de "Bagad Men Glaz"
Basic Steps for Bourrées, an article.